Over on the SonicGoose.com blog, the author has recently created a tutorial showing how to use Modesdeco which is a multi platform command line ADS-B decoding software application. ADS-B stands for Automatic Dependent Surveillance Broadcast and is a signal broadcast by aircraft that can be used to track them like a radar. Want to feed BaseStation and PlanePotter at the same time? No problem. 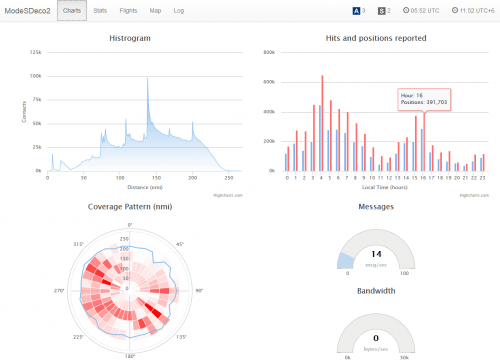 Want to add another data stream for Virtual Radar Server? No problem. Want statistics about the types of data being received? No problem. Want to run it on a variety of platforms, including Windows, Mac OS X, Linux, or the RaspberryPi? No problem. The author’s tutorial goes over setting up the software on Windows and turning on some features like it’s web statistics interface, interactive map and how to feed data to another virtual radar application like Basestation. In the future the author plans to write a second tutorial showing how to use another feature which allows a user to combine the ADS-B feeds from various computers running Modesdeco. Screenshot of the Modesdeco statistics web interface.